from Mother Mary to Kali. Back Design A single tri-pointed golden crown is enclosed in a gold flecked circle surrounded by a larger celtic knotwork circle which is inside of a gold flecked rectangle which is, in turn, inclosed by a rectangular knotwork pattern. "The Goddess guidance Oracle Cards can be used in conjunction with my other oracle cards, as they're all from the same family of light and love. You can shuffle the goddess cards in with my Angel, fairy..."
I'm not sure about directly shuffling one oracle into the other oracle as I know the goddess guidance cards are slightly larger than the healing with the angel cards, but I find using both oracles together very satisfying. It makes me interested in maybe persuing the fairy deck in the future. 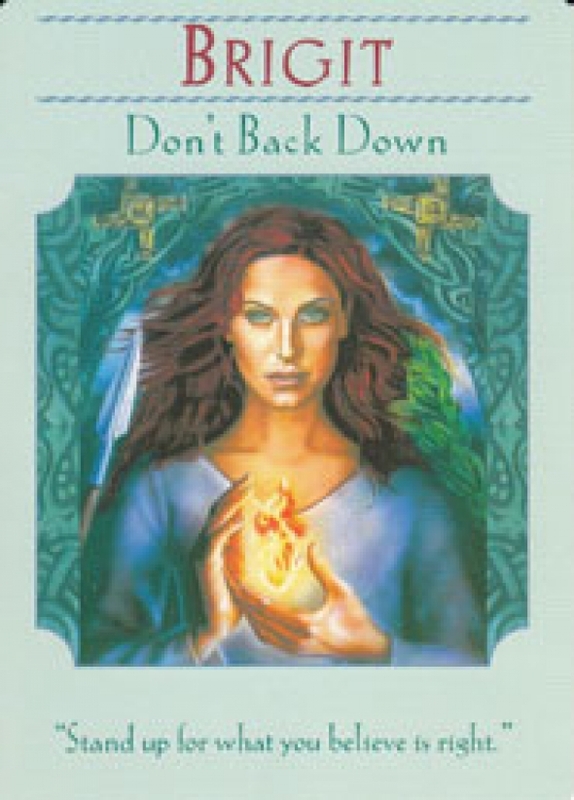 I find that the godesses form sort of a noun while the angel cards complement her with an attitude of composure or a verb. What you actually see on the cards is any number of different colors for a border. All of the colors seem pastel. At the top there is the name of a goddess, and a few key words for communicating with said goddess. At the bottom there is a special message from the goddess. In the middle there rests an artists rendering of the goddess. The companion booklet lists all of the goddesses in alphebetical order according to their names. All of the information on the card is repeated. Then there is usually a lengthy message from the goddess spoken in the first person narrative (otherwise, when the words "I will help you" are written the reader is expected to assume the narrator is the goddess herself). This is followed by a more brief listing called "Various meanings of the card." This is pretty self explanatory. It offers a few ways in which the card can be interpreted. Last, and my favorite part of the reading, is an "about" this goddess segment. Here you are given the proper pronunciation of the goddess' name, the various cultures from which she sprang, and how she has interacted with those who adore her. It seems that many die-hard goddess fans are disappointed by a lack of a "Hecate" or a "Persephone" card. The whole drama fit around Doreen Virtue seems to try to make her out to be like one of those fundamentalists who thinks that we should do away with things like television or industry and go back to a father abraham kind of life. Most people would like to peg her as a kind of a soccor mom v-chip fanatic who doesn't want her "children" exposed to blood and gore. However, I have never really seen anything to show that she is fighting against the blood and violence of television programming or the so called "dark deities" of spirituality. She is projecting her vision much like those who would project a vision with Proserpine. Nowhere does she insult Persephone like those who would claim that Persephone must be too dark for Dr. Virtue. In conclusion, the deck doesn't seem to be strictly goddess oriented as there is the occasional fairy or "fairy goddess".